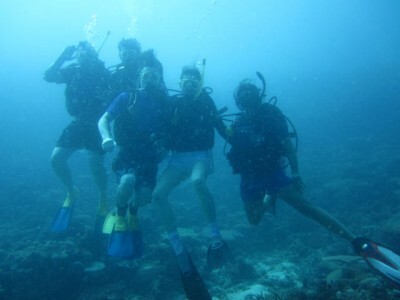 While sailing around the Fiji Islands, I signed up for diving lessons. There were two dive instructors on board (Kim and Dan) and the course was 3 days long. The first thing Kim said was that my beard and moustache would hold me back. That night I shaved. I’d had the beard for 16 years so seeing my chin was a bit of a shock. In the last 10 years it has gone quite white so the general consensus it was an improvement. We were given the course materials and told there would be a written exam on the last day. Most of the instruction was practical and we dived twice a day. We also practised some emergency procedures in the ship pool and in 5 feet of water just off the beach. In diving you always have a buddy who will keep an eye out to see that you are OK. There were four people getting their certification; me, Harry and Eli (brother and sister from Australia) and Laurence from PNG. After the first dive our instructor, Kim, checked our air levels and assigned us buddies based on rate of oxygen consumption. Eli and I were fairly efficient so we were buddies. Harry and Laurence burned through their tanks more quickly. This meant Eli and I could stay down longer while the others had to surface earlier. We spent the first few days learning the equipment and practising emergency techniques like how to find your regulator if it is lost and how to clear your mask if it fills with water. This reminded me of getting a pilot’s license. It is important to learn the material but it is critical to remain calm in a crisis. I suspect some percentage of people panic during these simulated emergencies. Everyone in our group passed with flying colours. We also learned hand signals for communicating under water. The most important thing is to remember that thumbs up is not OK but instead means you are heading for the surface. Using thumbs up instead of OK costs you a beer, payable to the instructors. Thanks to our diving diligence, Kim and Dan remained sober for the entire course. Sorry guys. Even out of the water our instructors Kim and Dan communicated with hand signals. After we graduated we had the pleasure of seeing our instructor Kim performing a hula dance. Hand gestures underwater were terse and to the point: I’m OK, I’m out of air, Don’t touch that! Hula hand gestures on the other hand are complex and mesmerizing. Once we had learned these basics we did several open water dives and even some simple cave diving. Swimming into a cave with the only a tiny light in the distance takes a certain nerve but underwater caves and canyons give a strong sense of flying. The best dive was at Sacred Island. Legend has it that this was the home of the first Fijians. It is forbidden to walk on the Island but there is excellent diving off the shore. After Hong Kong we travelled to Fiji where we boarded a cruise ship and spent seven days sailing around the islands. Fiji has hundreds of islands, some inhabited, some not. The first night was a captain’s dinner. We sat with the chief engineer who entertained us with stories of the previous ship, Reef Escape, although by now it may have been rechristened Reef Encounter. At the table we also met Lance and Jenny who were booked on the trip exactly a year previously. Unfortunately, as our host related, a massive storm blew up and drove the ship onto the reef. The captain was forced to beach it to avoid sinking. Lance and Jenny, brave souls that they are, accepted a replacement cruise exactly a year later. Many islands are still home to traditional villages. Since these are people’s homes there are certain courtesies that must be observed when visiting. Luckily our purser, Florian, had made contacts in the villages and we were invited to dinner. The greeting ceremony is fairly complex involving four members of our party. Traditionally, these are representatives of the clans: chief, warrior, and spokesman. After presenting the traditional gift of Kava our hosts welcome us and everyone shares a bowl. Then there is lots of music and hanging out. The woman of the village also sell handmade crafts and beautiful coloured fabric. These can be used to make a sulu, the traditional garment. It was funny to see many of the Australian men essentially wearing skirts. Luckily, they’re a tough bunch and carried it off with nary a snicker. In the first village we were entertained with excellent singing which included four part harmony. The dancing was led by a very talented dancer who knew how to play to the crowd. When we all got dragged up to form a conga line (probably not a traditional dance form) he got very frisky with the woman in front of him. The other villagers loved this and howled with laughter. In the second village the dancing wasn’t as good but it was fun to watch the village woman watch the men. One young woman was obviously very enamoured of the lead dancer and watched him with naked lust. He knew he was being watched and hammed it up, much to the delight of the women. The Fijian’s clearly know how to have fun. The ship was fairly small which allowed it to anchor off the small islands. It also meant that we quickly got to know the passengers and crew. Most of the people at the start of the cruise were Australian and we made several good friends. We hope to visit them later in the trip. The crew were very friendly and seemed very genuine. We felt very welcome. On the final night we bought traditional lays from the village. 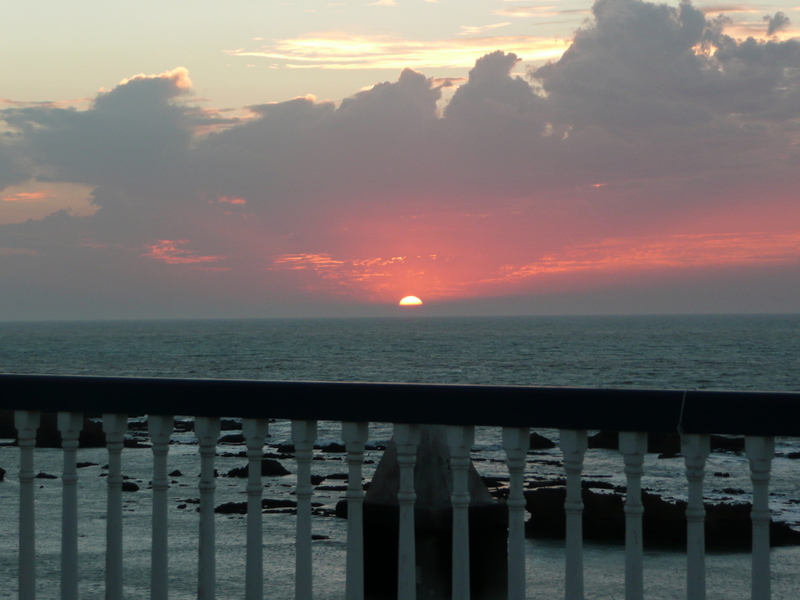 After dinner we watch the sun set from the top deck. No one was around and we felt like the boat was our private yacht. The sunset was the most spectacular I’ve ever seen. The sky seemed to be on fire. As darkness fell we tossed our lays into the sea. This is meant to bring good luck which in Fiji means a promise to return. We stayed with Steve who I met on the improv course this summer in Calgary. He lives a 3 minute walk from Causeway Bay. The first morning we went up to the Peak and walked around (Lugard Road), rubbing shoulders with the uber-wealthy expats. Our friend Erin spent months living in Hong Kong working on media displays for the Hong Kong Museum of history. It was very cool and we learned a lot about the Opium wars and the Japanese occupation. Most mornings I had breakfast at Café Zambra, an upscale café with good coffee and free WiFi. I was delighted to find that the owner is from Calgary. His accent gave him away. In fact Hong Kong is very similar to Vancouver with mountains on one side and the ocean on the other and the rumour is that over 200,000 Canadians live and work here. One night we had drinks at a 32nd story rooftop bar. With only waist height glass barriers between you and oblivion, Hong Kong restaurateurs are clearly not concerned with liability. It is highly recommended you settle the bill rather than dine and drop. 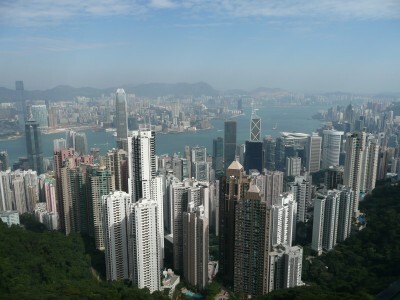 With so many people in such a small place, Hong Kong is a vertical city. Large department stores go up rather than out. We went to Sogo which was 15 floors. Steve showed us a high rise where floors 10-15 are all stalls selling electronics. Bought 2 voice SIMs and a data SIM at the airport for $25. Telco is pretty cheap. For that price got 50 megs data, 2 x 400 minute voice. We had some very authentic Dim Sum including a TV showing Bruce Lee movies. We were lucky to see an improv show starring our talented host. We drank at several bars along Wan Chai (avoiding the “free drinks”). One night we visited Temple Street. The street vendors were selling the usual knock offs but more interesting were the fortune tellers. My favourite is the bird which picks your fortune from a deck of cards. There was also some intriguing street Karaoke. We were beckoned by the small group belting out some song in Chinese. They seemed to be having fun but we declined their enthusiastic, drunken offer to join in. We also pub crawled Lan Kwai Fong. This included donning fur coasts and drinking vodka in a freezer room. I think this was meant to simulate Moscow. Outside we saw sailors flirting with the local girls. Apparently, letting a girl wear your hat is an advanced stage of courtship although it wasn’t the most advanced courtship ritual we saw on the street. We’ve been surprised how many countries have Christmas displays. In Dubai the airport had a Christmas tree. In Hong Kong the skyscrapers along the waterfront have light displays that span dozens of floors. 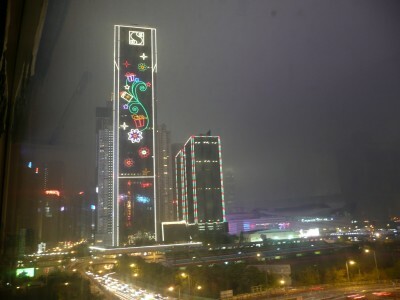 When Christmas is over a few minor adjustments and the same lights celebrate Chinese New Year. A very pragmatic approach. Hong Kong is clearly a business city. Everyone is discussing business. Everyone is networking. The café and restaurants are filled with earnest young men wearing the financial industry’s version of casual wear. The shopping is amazing. You can get anything you need. We replenished our supplies and replaced some clothes. This was a welcome change from Morocco. In fact just having taxi drivers who charged by the meter was a relief. All in all, a fantastic trip and a big thanks to Steve and Krystal for showing us the city. After spending 5 weeks in Morocco we decided on a change of scenery. 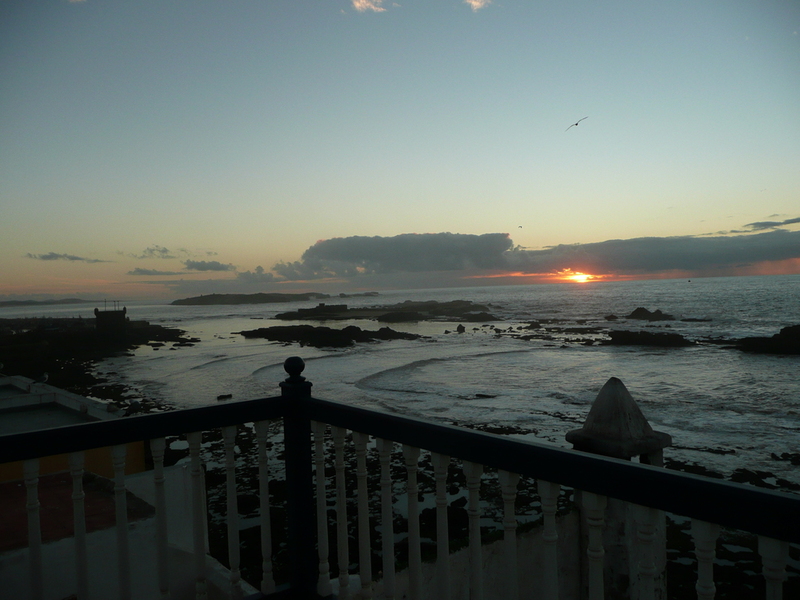 Even Essaouira was beginning to drop below 20 degrees centigrade. So we started looking for a new place to go. This summer in Calgary I met Stephen, a Canadian living in Hong Kong. He invited Carol and I to visit him and even offered us a place to stay. Checking the weather forecast in Hong Kong sealed the deal and we booked our flight. This kicked off a three day travel blitz. 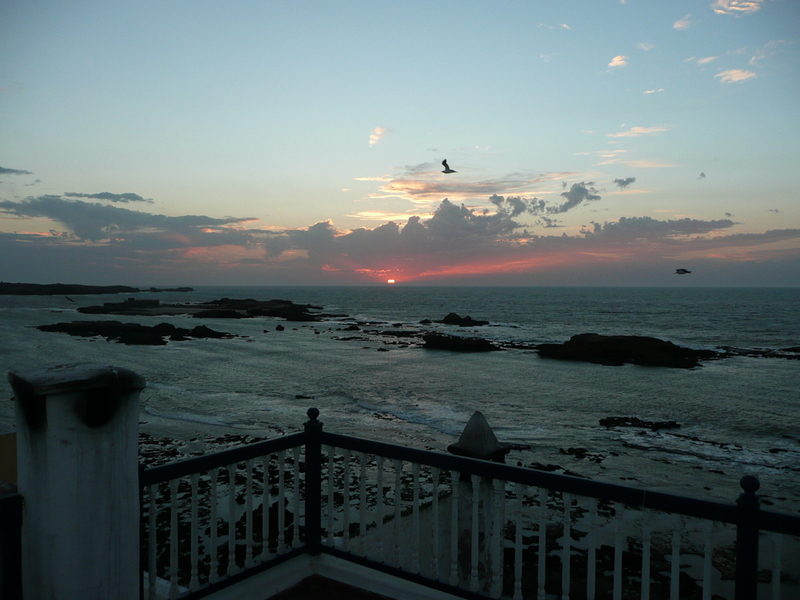 It took a day to travel from Essaouira to Casablanca where the major airlines land. We arrived late and spend a long time sitting in traffic. Our hotel was next to the train station so the next day we took a train to the airport. The airport was not very busy and we boarded our Emirates flight to Dubai. We were a bit concerned flying through Dubai as a Canadian couple had recently been stopped and jailed for a month while the UAE authorities tested their migraine medication to ensure it wasn’t contraband. We cleaned out our first aid kit of anything with an ambiguous label. Some head ache medication contains codeine which will get you a minimum four year sentence. We considered ditching our one month supply of anti-malarial tablets but they were well packed, labelled and we had a clear prescription. The flight was easy and the cabin well appointed. The meals were better than the usual airline fare. The back of seat entertainment was excellent. You can watch dozens of movies, TV and hundreds of songs. There is also a nose camera so you can get a pilot’s eye view of the flight. The Dubai airport transit lounge is like a large high end shopping mall complete with restaurants, shops and a hotel. We rented a room for 6 hours and slept like the dead. The room was excellent but we hardly noticed. The next morning we caught the flight to Hong Kong. 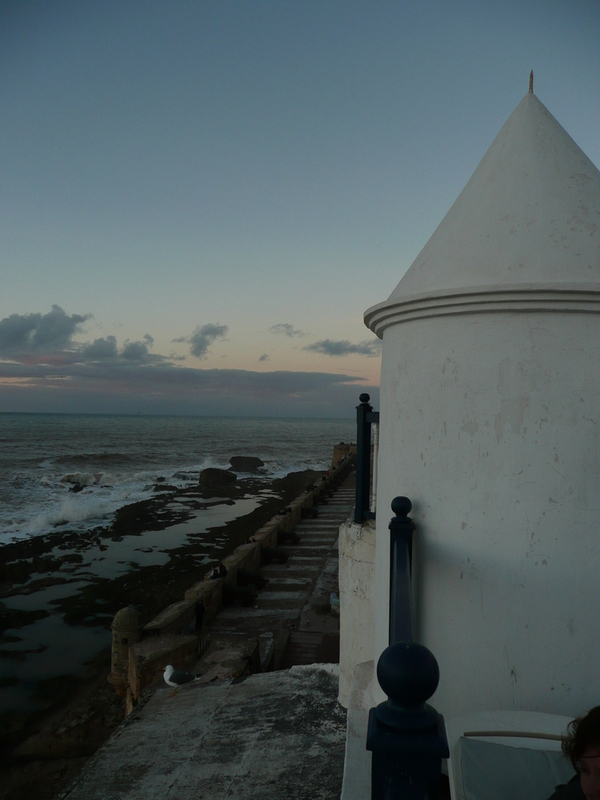 All told we spent 36 hours in transit (not including getting to Casablanca) and crossed 8 timezones. Just arrived in Hong Kong. The city looks amazing at night. Can’t wait to explore tomorrow.